Guava. Characteristics and Properties of guava tree: Scientific name, other names, botanical family, identification, origin. Content and active ingredients of the guava leaves and fruit. Guava benefits. Scientific name: Psidium guajava L.
The guava is a shrub or small tree up to 7 m high, sparsely branched. It has aromatic leaves, opposite, entire, 4-8 cm long, with prominent veins on the underside, resembling ribs. White attractive flowers, grouping from 1 to 3; numerous stamens arranged on a width disk. 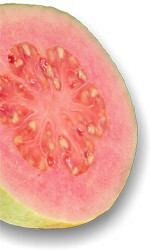 The guava fruit is fleshy, variable in shape and size depending on the variety. 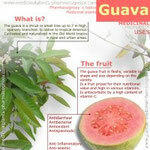 Guava is native to tropical America. Cultivated and naturalized in the Old World tropics in rural and urban areas. It is known the presence of gallic acid, ellagic acid, catechin, epicatechin, rutin and quercetin. Pentacyclic triterpene, guajanoico acid and B-sitosterol, uvaol, olenólico acid and ursolic acid. 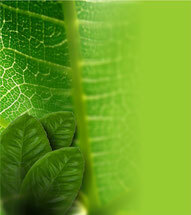 Guava leaves contain an essential oil rich in caryophyllene, nerolidiol, beta bisabolene, aromandreno, p-selinene. Also contain flavonoids, beta sitosterol, titerpenoides, leucocyanidins and about 10% of tannins. The high presence of tannins give to Guava antidiarrheal properties, also have demonstrated pharmacological activity as antibacterial, antioxidant, antispasmodic, anti-inflammatory, anti-anemic, hemostatic and sedative. It is indicated in cases of dyspepsia, edema, swelling, dizziness, diarrhea, nausea, nervousness, HIV, skin conditions. Guava is a fruit prized for their nutritional value and high in various vitamins. It antiscorbutic because they are high in vitamin C. In naturally has many nutritional and preventative properties in diseases like anemia. Decoction: boil for 3 minutes 10 to 20 g of fresh leaves in a quart of water. Ingest 120 mL, 6 times a day. The preparation of the decoction should be daily. Antibiotic properties are attributed to the decoction or infusion of guava leaves.